The dive site by the old boat ramp at the electrical transmission tower at Big Cliff Reservoir is an interesting place to go SCUBA diving. It is not as scary of a dive site as the upper river bottom but it is still a serious dive site due to the current and the ease of which you can go too deep. This is an interesting site for the steep submerged cliffs and the flooded river bottom. Copyright 2013 Robert Ashworth. Big Cliff Dam at the bottom of the reservoir regulates water flow coming out of Detroit Dam. The main draw for this site is the interesting submerged cliffs and river bottom. Even though visibility is usually not great, it is still interesting to explore along the cliff faces and practice drift diving. If you come to dive the upper river channel and get cold feet, this is an alternative place to dive. Detroit, Oregon is just up the Santiam Highway. The turn-off to this dive site should have a sign for the Detroit Dam but the sign might be missing depending upon homeland security threats. Look for the right turn along the reservoir. Park by the old boat ramp next to the big metal electrical transmission tower. Imagery ©2017 Google, Map data ©2017 Google. The dive site accessible from the old boat ramp at the top end of Big Cliff Reservoir has some interesting submerged cliffs to check out. We suggest sticking along the north shore of Big Cliff Reservoir. We haven’t explored much on the southern shore so we can’t provide many details about it. Sticking to the north shore also makes it much easier to get to an exit and back to your car. 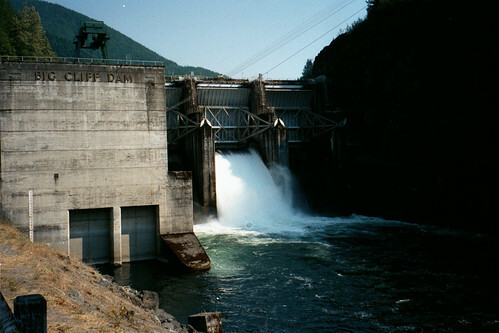 We like to enter just upstream from the big metal electric transmission tower and drift down underwater. Keep to the right and hug the cliffs at a depth that you want to stay at. This dive site can go below the maximum recreational SCUBA depth. Sometimes there is an eddy that will slowly push upstream right along the bank. If the eddy is running, you can drift down with the current a little deeper and farther away from the bank, and then drift back up toward the exit closest to your car at a shallower depth. There are potential underwater obstructions on this dive site. It isn’t as bad, in our experience, as the upper riverbed dive site but the risk is still there. There may also be potholes in the deep old riverbed that could have pinch points and caverns that could trap and drown you. Be careful and dive within your personal limits! We like to enter just above the electrical transmission tower and float down to the main part of the dive site. The old boat ramp is another place to enter. The last time we were here, the boat ramp was blocked off for boat traffic but you could still walk down to the water easily. This boat ramp could reopen in the future or be more closed off than before. The old boat ramp is also a good place to exit if your dive takes you back to this point. Otherwise, there are a few places along the northern shore where you can exit and scramble up the bank to the road. The scramble is difficult. This is a shore dive although a boat could help if you want to drift much farther down the reservoir. There is always a strong current here. Underwater obstructions and hazards are probably present. Be careful and dive within your personal limits. You could get hung up underwater and drown, and be very dead. Usually we get around 10 feet of visibility here. Water temperature varies based on what Detroit Dam is doing. It can be down around 38F or up to about 65F depending on the time of year and upstream conditions. We have only gone diving here in the winter and spring. It was fine during those times. The rest of the year is also probably fine although in the summer and fall, there may be worse visibility due to poor water conditions. You can surpass 130 feet at this site if you try. Be mindful of your depth and plan your dive. 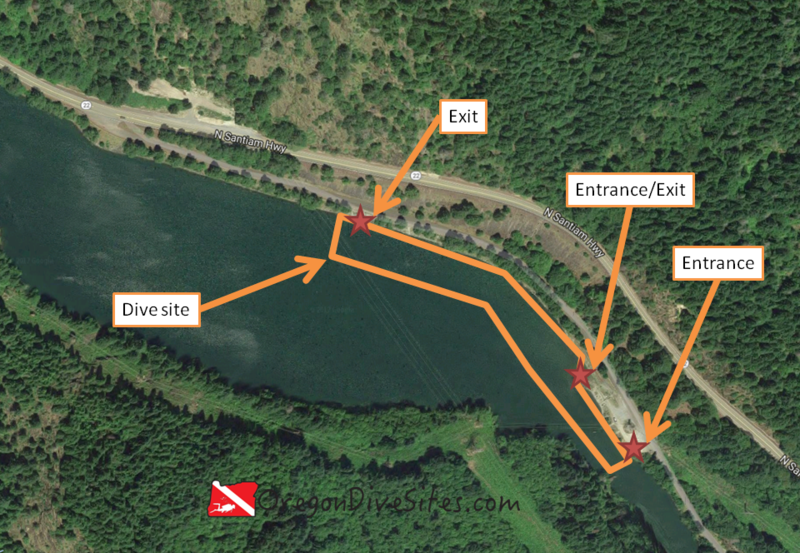 We suggest rescue diver training and drift diver training for this site. The old boat ramp at Big Cliff is an intermediate level of difficulty dive site. The main challenges are the current and potential surface swim or scramble up the bank, and the potential for underwater obstructions to catch and drown you. 100 feet or less. But coming back from the lower exit is about a 600 foot walk. Depending on how well you navigate and what the current is doing, none up to 600 or so feet to get to an exit. As we have already mentioned several times, this site has the potential for underwater obstructions of various types that could catch a diver and drown you until you are completely dead. The current can be tricky here and we treat this site as a drift dive. We suggest taking a good dive light so you can see your gauges and see where you are going. When you get deep here, it becomes very dark. We have several dive lights that we trust and use all the time when we go diving in Oregon that we list over on our Gear We Use page. The closest dive shop is in Salem. Up in the town of Detroit, there are several decent restaurants. Let us know if you have a favorite that we should check out. There are many state and federal campgrounds in the area as well as a few private campgrounds. Check at the USFS ranger station in Detroit for primitive camping options on the forest roads. We haven’t tried any of the hotels or cabin rentals in the area yet. Please get in touch with us if you know of a place that is SCUBA diver friendly!